Today we are interviewing T. Denise Manning, author of the self-help/inspirational book Imagine Potential (Imagining your possibilities and reaching your full potential, Life Coaching Guide to Success). I’m just a woman that has applied her lessons, her mistakes, and her experiences to my life and used them as motivation. I wear many titles but at the end of the day, I’m a woman that lives to inspire others. 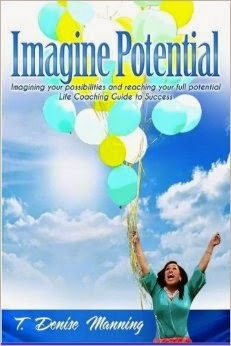 Imagine Potential is an inspirational guide book for girls age 12- 18 however any young woman can benefit. The book is a reminder to never give up, punch fear in the face, jump the hurdles to your success and much more! The book also has worksheets in the back to inspire every girl to write down her goals. What motivated you to create a movement based around inspiring girls? I was motivated to INSPIRE girls to imagine their potential because of working with youth for over a decade now. It seemed right and natural! What do you think are some of the biggest challenges facing girls growing up in modern society? Self-esteem issues. Girls need to realize that their worth is not validated by someone opinion of them. Girls need to realize that they define their worth and who they are. I hope it inspires girls to imagine their potential… whatever that is! Outside of your book, what other resources would you recommend for empowering girls? I encourage all girls to find a mentor! A mentor that they respect, someone they can talk to and coach them along. I’m just finished my first children’s book titled “ I’m Unique” its an inspirational book for girls 0-7 years of age!